Success often comes after repeated failure. That's one of the key messages learned by a young scientist who worked with an Augsburg physics professor to place at the largest international science fair. Taylor McCanna, a 2012 graduate of Breck School in Minneapolis, worked last summer with David Murr, an Augsburg physics professor, on a high altitude weather ballooning project. 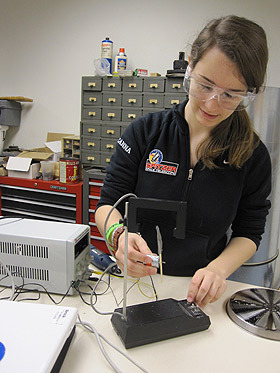 She was challenged to design, build, and test easily affordable equipment that ultimately could be built by other students and even the general public. "Dr. Murr initially gave me projects and experiments that he knew would not work out," McCanna said. "It was frustrating." It took six prototypes before McCanna created a device that could measure the global electric circuit. The "field mill" she built was attached to a high-altitude weather balloon and sent into the atmosphere to gather the data that could be an indicator of global climate change. "Essentially, Taylor and other students are working to find a way to 'crowd source' research," Murr said. "These low-cost and easy-to-build field mills make it possible for other high school students—and the public—to contribute to important scientific research." Murr said that McCanna's field mill means scientists might not need to spend thousands of dollars to gather reliable data. Instead, an enthusiastic public can be invited to spend a couple of hundred dollars to make field mills for balloon launches and then can gather and add data to the international body of knowledge. McCanna's efforts earned her second grand prize in electrical and mechanical engineering at the Intel International Science and Engineering Fair (ISEF), which brings together 1,500 scientists in grades 9-12 from 70 countries. "This fair is the premiere science competition in the world exclusively for high school students," said Lois Fruen, McCanna's adviser and a teacher at Breck who has been honored as one of the country's outstanding high school science teachers. McCanna believes the mentoring she received from Murr will put her ahead of her peers at Purdue University, where next fall she will begin studying astronautical and aeronautical engineering. "The tasks and failures I experienced with Dr. Murr built my creativity, thought processes, and innovation," McCanna said. "He inspired me to keep improving. He also prepared me to talk with experts in the field, to have intellectual conversations about my work, and to develop my presentation, technical, and critical thinking skills." Murr said that McCanna's experience at Augsburg, where she had chances to interact with undergraduate researchers across many disciplines, helped her learn to easily explain her project to people from all walks of life. "Taylor is comfortable talking to diverse audiences and can accurately describe her research to scientists in and outside her discipline, as well as to non-scientists," Murr said. "This is a critical skill for any scientist so that we can ignite the curiosity of the general public and garner support for pursuit of the sciences." Fruen said the Augsburg environment helped propel McCanna forward, and has other students at Breck. "Dr. Murr treated Taylor like a graduate student, allowing her to find her way with just the right amount of guidance," Fruen said. In addition, Fruen said that McCanna presented to sixth- and ninth-grade science classes at Breck, helping ignite the curiosity of young students. McCanna also presented at a formal seminar to the Breck science department, mentors, school administration, and others. McCanna's success sparked interest in two more Breck students who now are researching with Murr and Ben Stottrup, associate professor of physics at Augsburg College. These students are interacting—as McCanna did—with researchers in Augsburg's Undergraduate Research and Graduate Opportunities (URGO) program, a 10-week summer research program that crosses many disciplines. Augsburg's connection to the science program at Breck School dates back to mid-1980s when now Emeritus Professor Arlin Gyberg helped set up Breck's Advanced Placement Chemistry program. Murr is a 1992 graduate of Augsburg College. He spent two years in Tanzania with the Peace Corps and completed graduate studies at Boston University and post-doctoral work at Dartmouth College. He also spent a year working in space policy with the U.S. State Department. In addition to her placement at ISEF, McCanna's project earned awards for the Twin Cities Regional Science Fair Award for Excellence (and was selected as one of the top three projects in her division), the American Council of Engineering Companies Grand Award, the Minnesota Astronomical Society Award, the U.S. Army Award, the U.S. Air Force Award, the U.S. Navy Award, and the National Society for Professional Engineers Award at the Minnesota state science fair. She also was picked to present her work at the Tri-state Junior Science and Humanities Symposium and was a finalist in the Young Naturalist Awards contest, a national competition sponsored by the American Museum of Natural History. TOP PHOTO: Taylor McCanna works in the Augsburg College labs. She developed six prototypes of a field mill before creating a device that could measure the global electric circuit. 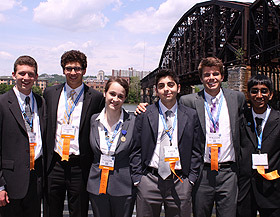 BOTTOM PHOTO: Taylor McCanna, third from left, is shown with other finalists at the Intel International Science and Engineering Fair (ISEF). McCanna recently graduated from Breck School in Minneapolis, and in the fall will study at Purdue University.